Previously, we looked at how not to fall into the mirage of unicorn hunting in your “big data” and why you should not delay too much in adopting data science techniques into your business operations. In this post we will look at why data can be both your best and worst enemy. Data is a double edged sword. The enterprise with the best data will greatly benefit from having a significant advantage over its competitors and consequently, enterprises should seek to amass as much data as possible. As we previously learned, an enterprise leveraging its own data allows it to gain a competitive edge on the chessboard. However, more often than not, enterprises are facing a big dilemma: who generates and then consequently who owns this precious information? Quite often most of it originates from the customer and in order to alleviate this issue and repatriate the precious data points back into the mothership, enterprises leverage the XaaS model. These ”X” (anything) as a service products benefit consuming companies by lowering the cost of operations, reducing or eliminating CAPEX. It also to a certain extent provides data aggregation, market comparisons and a range of other useful capabilities. Whilst useful for lowering cost and product implementation / service delivery for the deployer, the real beneficiary is in fact the XaaS provider. The provider can then leverage this information by monitoring the consumer behaviour and usage of its product in order to identify the spread of new successful innovations. 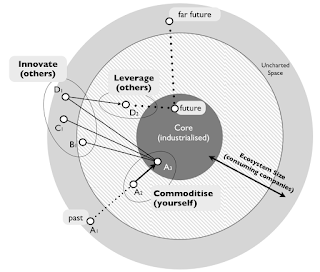 This is basically what Amazon and others have been applying quite successfully over the past decade and is known as the Innovate - Leverage - Commoditise model (ILC). And in certain extreme case they enter market not to make money but simply to collect more data to drive other parts of their business. As you can see, you have to control which data you need to keep and which you can leak or generate for a third party. Without this understanding, your enterprise business might end up being exploited as it just becomes a puppet within a bigger ecosystem which you do not own. In Fact, more often than not, the service provider is a wolf in sheep’s clothing: he presents himself as wanting to ‘help out’ but in fact and unfortunately, there is less collaboration and more exploitation driving his intentions. Enterprises are therefore facing a dilemma and they have to adopt and consume XaaS in order to stay competitive, while trying to avoid leaking their innovation by feeding the ecosystem with more information. One efficient way to counter the later is to form their own ecosystem and leverage data from it which in turn enables them to partially workaround the enterprise’s inherent innovation limitations. However, this is often easier said than done. The data gathered is as important as the data generated as this can either make or break an enterprise. Creating one’s own ecosystem to draw information from will quickly become critical as an enterprise cannot solely rely on a single source of information to stay competitive. Maybe what we will begin to see in the near future is the emergence of information exchange or even data collectivism among enterprises (a behaviour triggered by collective prisoner's dilemma) in order to counterbalance the mastodons of data vacuuming, such as Google or Amazon.